Orange and Black wordpress theme is a Web 2.0, widget-ready, AdSense-ready, bold, high-contrast theme with clean, organized layout. Recent Posts/Recent Comments are also included. No plugins are needed. 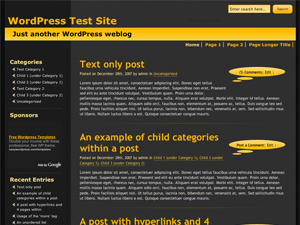 This wordpress template is CSS and XHTML validation/standards compliant. This is a two column theme, mostly black and dark gray. The header is orange and so is the search function – which is placed in the top right corner. Sidebar is wordpress widgets compliant. Orange and Black wordpress template was designed by Chromatic Sites.